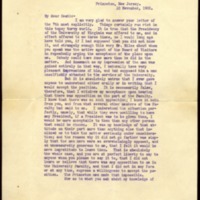 Woodrow WIlson tells his friend Richard Heath Dabney that he was offered the presidency of the University of Virginia. I am very glad to answer your letter of the 7th most explicitly. Things certainly run riot in this topsy turvy world. It is true that the Presidency of the University of Virginia was offered to me, and in effect offered to me three times, as I would long ago have told you, if I had supposed that you did not know it, and strangely enough this very Mr. Miles about whom you speak was the active agent of the Board of Visitors in repeatedly urging the acceptance of the place upon me. Nobody could have done more than he did in the matter. And inasmuch as my impression of the man was gained entirely in that way, I naturally have very pleasant impressions of him, and had supposed him a man unselfishly attached to the service of the University. But it is absolutely untrue that I ever gave anyone to understand either orally or in writing that I would accept the position. It is necessarily false, therefore, that I withdrew my acceptance upon hearing that there was opposition on the part of the Faculty. I knew that there was no such opposition; I knew it both from you, and from what several other members of the Faculty had said to me. I understood the situation perfectly, namely, that while they were unwilling to have any President, if a President was to be given them, I would be more acceptable to them than any other person that could be chosen. It was my knowledge of that attitude on their part more than anything else that inclined me to take the matter seriously under consideration; and the reason why it did not go farther was simply that the men here were so overwhelmingly opposed, and so unmeasuredly generous to me, that I felt it would be mere ingratitude to leave them. That is absolutely the whole case, and you are at perfect liberty to say to anyone whom you please to say it to, that I did not learn or believe that there was any opposition to me in the University Faculty, and that I did not in any form or at any time, express a willingness to accept the position. The Princeton men made that impossible. Now as to what you ask about my knowledge of Mr. Venable. I am sorry to say I have none whatever,— only the very pleasant impression he has made upon me as a man during one or two very brief interviews. That impression has been better than the impression made on me by any of the other men whom you mention. There is in Venable a directness and simplicity and geniality, which I think strike even the most casual acquaintance at once as being the qualities of a straightforward and genuine man. I should not be surprised if he would do you real service in the office. I feel like kicking myself that I cannot think of anybody whom I would be willing to recommend out of abundant knowledge of him. But the fact is so, and I must not try to make any suggestions outside of the ranks of those whom I know well. Wilson, Woodrow, 1856-1924, “Woodrow Wilson to Richard Heath Dabney,” 1902 November 10, WWP20451, University of Virginia Woodrow Wilson Letters, Woodrow Wilson Presidential Library & Museum, Staunton, Virginia.